Rig-Veda, the oldest book in the world, mentions ornaments worn by the gods. Rudra, a Vedic deity, is described as "shining with brilliant gold ornaments" and "wearing" an adorable, uniform necklace". ... an ornament called sagi is a central head stud that supports the phulkari or dupatta or other headgear. It is a hemispherical boss with raised work, all over with floral patterns carved out in horizontal circles, encased in lines and dots and dashes, and a star in the centre. Now there are half-a-dozen varieties of sagi. When at the top-centre a coloured stone is fixed in it, it becomes sagi uchhi. Where several round beads are hung at the edge with silver chains, it becomes sagi motianwali. When two additional sagis are linked to the upper side they are known as sagi phul. 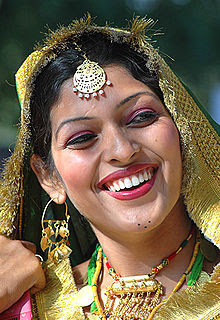 is a popular folk dance of women in Punjab region of India and Pakistan. The dance is often considered derived from the ancient dance known as the ring dance and is just as energetic as Bhangra; at the same time it manages to creatively display feminine grace, elegance and elasticity. It is a very colourful dance form which is now copied in all regions of the country. Women perform this dance mainly at festive or social occasions. Giddha costume consists of bright coloured clothes complimented by heavy jewellery. The Punjabi Salwar kameez (tunic top and loose fitting pants worn by women in Punjab region) and/or Ghagra (colorful long-skirt) in bright and rich colours are the typical costumes of the dance, Giddha. Women also wear ornaments like mathapati on the forehead. Giddha is usually danced in harmony, swinging and twisting the body, shaking the shoulders while bending knees and clapping. Their characteristic is the form of a small bell. They come in all kinds of material, gold, silver, with pearls. Often worn by a bride and the bride maids. 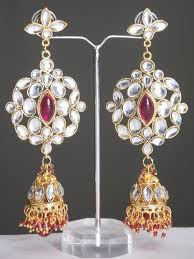 This kind of earring is worn in India. But they show differences from region to region in India. CLICK for more Punjabi jhumka samples.